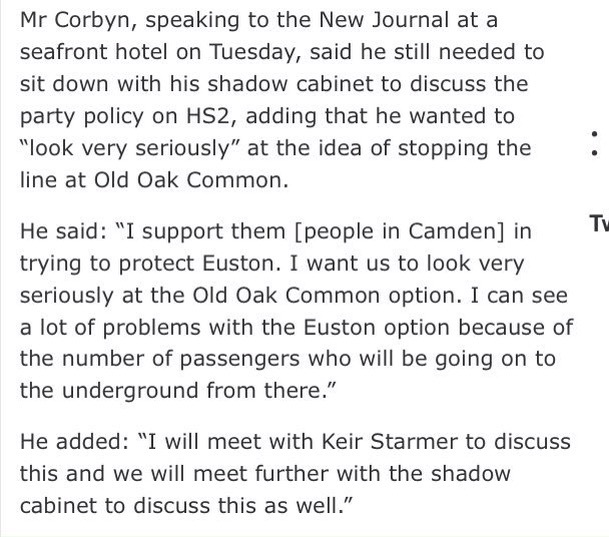 What did Corbyn say in CNJ interview which left shadow rail minister feeling undermined? LILIAN Greenwood offers up the text of her speech to her local constituency party membership in Nottingham South in which she asks for understanding over her decision to resign from Jeremy Corbyn’s shadow team at Westminster. It seems like the polite thing to do in an era when resignation letters are filed to Twitter. She was the shadow transport secretary, which obviously put her on a little bit of a collision course with Labour members in Camden, many of whom want the party to end its official support for the HS2 railway scheme. When she came here in 2014, she stuck to her guns, and spoke enthusiastically about the £50 billion project despite being among some of the country’s biggest HS2 sceptics. It was admirable really that she did not adapt her views to tune in with the audience seh was standing in front of, as so many chameleon politicians do, but it turns out, from her speech, that her visits to Camden had some bearing on her decision to abandon Corbyn last month. The hostile media bit may have been an indignant speech bubble piece in the CNJ, (see above) which some readers may have thought to be too simplistic or cartoony but everybody knows where the paper stands on that particular issue and it ultimately summed up the mood in the room. In terms of what top rank politicians face elsewhere, Ms Greenwood will no doubt acknowledge it was hardly cry yourself to sleep stuff. That journalist was Koos Couvee, from the Islington Tribune, the CNJ’s sister paper, who was in Brighton covering the Labour party conference last Autumn. Corbyn, of course, had only just been elected leader then, but as HS2 was the biggest issue affecting our news patch, we wanted to know where he stood. Given Ms Greenwood has vividly name-checked this incident in her reasons for resigning, it might be worth winding back to re-read what Corbyn actually said when he was buttonholed by our guy in the conference corridors and asked for a take on the demolition at Euston and the growing calls for the project to be moved to Old Oak Common, a view which Sadiq Khan, the new mayor of London, seems to have recently been interested in. Ms Greenwood’s speech contains lots of other grievances with Corbyn, so it’s unlikely she’d be still be standing shoulder to shoulder with the Labour leader regardless of what he had said to Koos that afternoon. The EU referendum stuff trumps Hs2 in terms of sore points right now. Corbyn’s supporters, however, will be scanning the comments which she says upset her so much in a search for the bit where he says he was thinking about dropping the party’s support for HS2 as Ms Greenwood claims – the unions like the project, and the title of the article is ‘Corbyn says yes to high speed rail’ – and where a policy decision was announced without consultation with his shadow team. She says he undermined her. He says in those quotes that he wants to sit down and talk about it. In the meantime, while we’re sorting out who said what when, the diggers continue to close in.